Persistence layer in SAP HANA manages logging of all the transactions in order to offer standard backup and reinstate functions. In built feature Disaster Recovery of SAP HANA database is utilized by this layer. In the data volume backup is set aside in as savepoints. Data goes to the persistence layer from main store and after SQL Statement is processed in column store. It is responsible for the durability and atomicity of transactions. Moreover, this layer is built based on the persistency layer of MaxDB, which is SAP’s traditional relational database. It guarantees that after a restart the database is reinstated to the most current committed state, and these transactions are completely implemented or totally taken back. As memory is volatile and database may restart and a power failure may happen; therefore, a persistence layer is required. It manages both data and log volumes on the disk, and also offers interfaces to read and write data that is influenced by all the storage engines. It uses a combination of shadow paging, write-ahead logs, and savepoints. 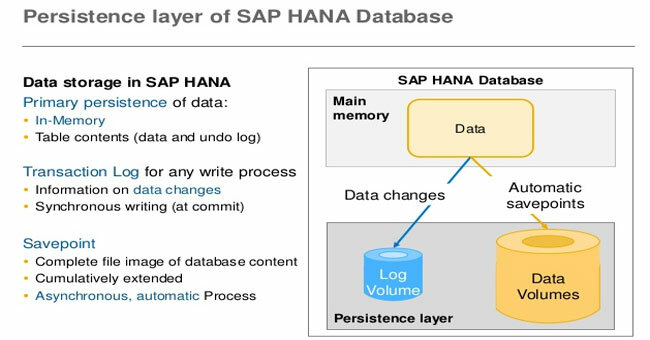 In the SAP HANA database all transactions dedicated on the persistent storage are saved, stored and referenced by the user of the persistency layer. It is the chief line of protection in contradiction of power failure, operator errors and system crashes. The SAP HANA persistence layer exist in on either internal disks or single node or on shared storage or multi-node cluster and uses two volumes that is Data and Log. The persistence layer is where a present copy of data and the system software are kept. It is also the basis of data for a node failover, thus the persistence layer must be quick for prompt failover and undeniably dependable to evade disturbance. Although there may be other bases of data in the formation, these bases have retrieval time in the range of minutes or hours; in compare, recovery from the persistence layer is instant. By using the SAP Block API, persistence is regulated by the SAP HANA nameserver. This guarantees exclusive access to persistence using SCSI-3 PGR or persistent group reservations. Data permanence is naturally secured by a persistence layer. Data variations in the database should be copied occasionally to disk to make sure a complete copy of the business data on disk, and to retain the present state of the database and all of the data in the persistence layer.